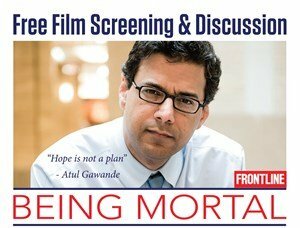 EOLCNY Volunteer Jane Lowers will host a screening and discussion of the PBS Frontline documentary film “Being Mortal” based on the book by Dr. Atul Gawande. “Being Mortal” is a 50-minute film that explores the hopes of patients and families facing terminal illness. The film will be followed by a discussion with the audience about end of life planning, health care proxies and other advance directives, talking with loved ones about end of life care, and communicating effectively with doctors. This program will be held at the Co-op Village NORC. This program is not open to the public.